Bhutan Innovation and Technology Center organized The Business Idea Competition of Bhutan 2012 from April to June 2012 and I walked out of my comfort zone to take part along side some 50 of them. Well it was one totally different and comfortable experience dealing with cooperate people. And on top of the experience my idea of Indoor Menchu Service made it to the top ten Business Idea "for its Excellence". 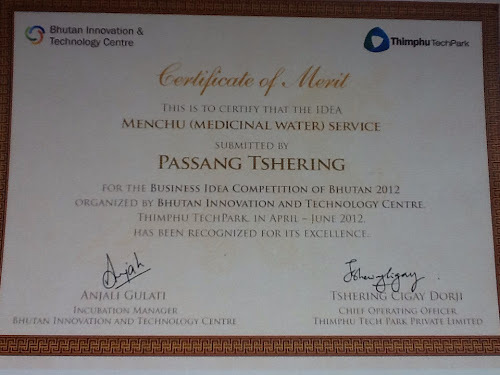 Thank you Thimphu Tech Park and Bhutan Innovation & Technology Centre for the recognition. I will come with crazier idea next year. 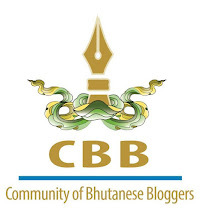 I am exploring a story about the emergence of bloggers in Bhutan, and you are undoubtedly one of the most prominent ones. I am sure you know that your blogpost in response to our Health Minister's comments about Bhutan last year received widespread circulation in Singapore. I think readers in Singapore would be very interested to know more about what motivates you to blog, as well as the challenges you face. if you are willing, I hope to meet you for dinner or coffee/tea in the evening or late afternoon any time from Monday to Wednesday. I will be staying at the Yeedzin Guesthouse, but I can meet you at any place that is convenient for you. I will also be in Thimphu on the 6th of August. I do hope you will accede to my request, and a lot of Singaporeans would definitely like to hear from you. I have committed to give interview to one of your peers on Drayangs and Folktales. But due to geography of our country coming for dinner and coffee may not be possible, because I am in Wangdue. Thank you anyway. Please Send in your questions via email and I will try to give you the reply at the earliest. But if you plans to travel through or to Wangdue then we could really sit for a coffee. Please keep your question simple because I have very poor vocab.